Challenged with integrated a modernized, attractive site with multiple legacy IT systems, we utilized our WordPress know how to build AdairGraphic.com with the end user in mind. Chock full of features such as single sign-on, job tracking, quotes, invoices, contact management, we created a site that helps Adair win new customers and keep existing customers with highly convenient, self-serve dashboard functionality. Starting from a legacy website with very limited functionality, our client wanted a new website which was both a sales tool as well as a customer support and retention tool. Multiple existing systems needed to be integrated into the website, allowing for a single sign-on solution with a high level of functionality. Moreover, the client wished to transform their identity from one deeply leveraged in the more traditional printing business to an identity that showcased what makes them unique in the market: powerful mobile solution, content management systems, and other digital capabilities. 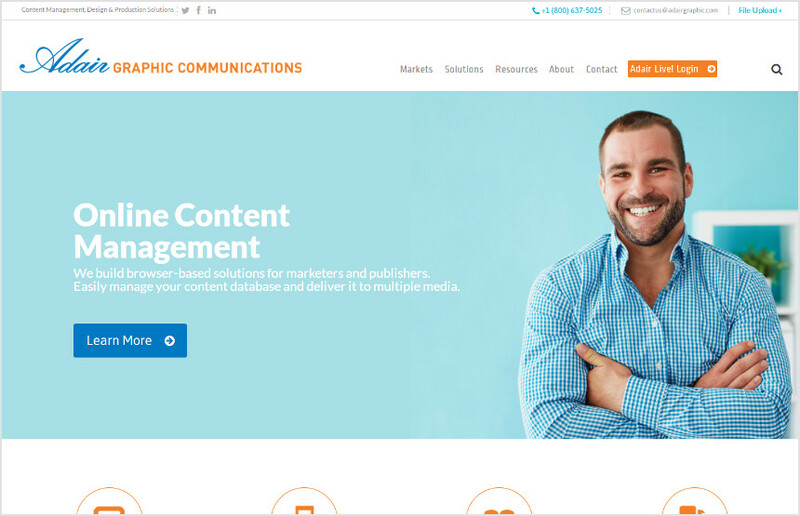 We chose WordPress as our content managament platform. Using it’s robust backend administrative dashboard API, we integrated multiple existing legacy systems into an attractive and highly functional dashboard, providing file upload, quote, invoice, job tracking, and contact management capabilities. This allowed us to not only tap into the broader community of WordPress developers, but to integrate our own solutions in a way that provided a consistent UI experience for users of the legacy solutions. Attractive, functional, this site is what it set out to be: a great sales tool and a customer service tool. This website was created with WordPress and other open source tools. This means no licensing fees and access to a broad community of open source developers. We don’t pretend to reinvent the wheel. This site looks great on mobile, with graphical elements stacking nicely and thought put into how they are presented on mobile platforms. Studies have shown mobile responsive sites see 35% more engagement. This is one of them. This site integrates WordPress with legacy systems already deeply in use, allowing for seamless communications between these systems, all leveraging the WordPress Dashboard API for a consistent UI. Our client holds the keys to their website. Because we chose WordPress as the content management system driving the site, updates and upgrades are automatically applied hands free. We are thrilled with our new site. We not only got a great new look and brought our online presence up to date, we developed a secure portal that gives customers instant access to critical information. This [website] is a market differentiator for us.